I think when designing attractions it’s essential to remember that they do not tell stories in the way that we’re used to. They have more in common with dance or music than movies or books. Movies, books, and plays tell stories through the use of characters, dialogue, and their interactions. They all essentially rely on the written or spoken word to create their story. Dance and music are different. To say a ballet gets it’s meaning through the synopsis in the program is ludicrous. It’s a useful tool that gives the dance clarity and context, but the actual story is told primarily through movement. I think the danger we face when trying to create attractions, especially as time goes on and we try to imbue more meaning and complex, multidimensional stories into them, is that we focus too much on the characters, dialogue, backstory, and story in the traditional, written, sense rather than using the medium at hand. We’re at danger of giving immense attention to songs’ lyrics while giving only marginal attention to the music itself. Lyrics give clarity and specificity to music, but truly good music conveys the essence of that story with just the melody and harmony itself. @pureimagineering defines Story as someone wanting something badly and something getting in the way. (Paraphrased). I think I’d broaden that definition though and say the essence of Story, and really theme as well is a progression of emotions generally involving conflict and release, that is shared between the storyteller and audience. We usually channel that emotional progression into metaphors of characters, events, circumstances, and themes. Most types of storytelling require the storyteller to assign all or most of these for the audience. Written and spoken language require specific abstraction to relate ideas and meaning. But music and dance don’t. It can help make sure everyone is on the same page but doesn’t really affect the outcome. A truly well written song will convey its story and meaning with or without lyrics. Lyrics just take a song about grief and give nuance about the death of a specific person and guide the audience in interpretation. However it’s worth noting that audiences often strip away details that they have difficulty empathizing with or are irrelevant to their life and insert their own experiences instead. See the popularity of “part of your world”. I’d dare say most people can relate to being a mermaid wanting to be in the human world. In fact, these days, most people probably wish to be AWAY from the human world. The written story of the song acts as a way to give specificity to a broader musical statement about longing and wanting to be part of something. Surely the song wouldn’t function as well without that attached cipher, but I’d argue any similar lyrical statement would work just as well. And the lyrics without the music, or attached to the tune of Yankee Doodle would largely be a footnote in history. Indeed, in musical theatre (and Alan Menken’s work in particular) the “I want” song is a classic staple – often the most popular song of any show, and they tend to have very similar musical features. The same story is being told musically, again and again. And if audiences are bound to insert their own specifics into a story, then it’s up to us to craft the larger framework of emotion that will direct what experiences they choose so they arrive at the intended meaning. Anyway, this is all to say, that themed entertainment is a storytelling medium where stories are told through ENVIRONMENTS, spaces, objects, and the progression of those locations. Yes there are characters and setups that can help clarify and direct the intended meaning, but they should merely be channeling the story that’s already around them. It’s insanely important for designers to remember this. To not use the medium at hand is akin to writing lyrics for a song and then slapping them on the first melody that syllabically fits. I think the comparison in storytelling between books/movies/theatre and music and how that relates to themed entertainment is interesting for another reason too. Books/movies/plays tend to have a bias towards very dramatic arcs in emotion whereas songs tend to have a bias towards relishing in one particular emotion with a much subtler arc. In part I think this is due to length. The most popular manifestations of the written word mediums are novels, feature films/long form television, and 2 hr plays. Music’s most popular form is the song. When compared to a full album, opera, movement, or symphony (or to the short story, an episode of a serialized tv show, chapter, or scene)you start to see similar ranges. But the question then becomes what are the equivalents in themed entertainment? Is a park equivalent to a play or symphony and each attraction is merely a scene or movement? Or is each attraction an entire movie unto itself and the park is more of a library? Or is an entire attraction just a part of a scene, or just a song relishing in one feeling, the land the scene, and the park the whole work? I don’t really think there’s an answer yet and maybe the beauty of themed entertainment is that we won’t be bogged down by presiding notions of how much time and space a story warrants. Disneyland might function more as a library of self contained adventures that are only broadly related while Animal Kingdom is a much more carefully crafted overall story with each land providing supporting scenes. And they’re both great! I think it’s safe to say in general that as time has gone on the scope of Story has changed from individual attraction, to land, and it’s leaning towards park now. I certainly think the ambition though among those of us that see the potential of themed entertainment is to see a truly fractal park. Where the park is a masterwork of Story/theme and each contributing smaller portion echoes that theme and adds to it. 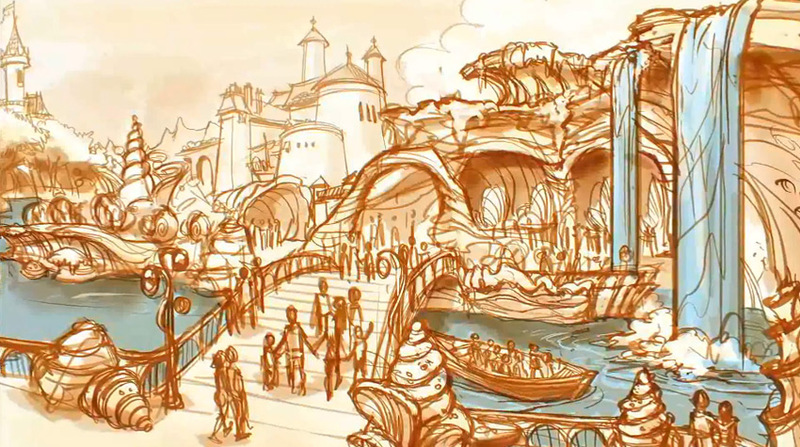 And hell in my ideal WDW fantasy the entire resort still creates an overarching idea. (Humanity And Hope for the Future). But it’s worth noting that this is only one approach, even if most of it see it a bit like the holy grail. A library approach is legitimate too – and when done well (aka organized) might even be a more satisfying experience. I think the interesting thing about Disneyland is the diversity of experiences it offers-not only in themes, but in the arcs of attractions. Some attractions are entire play-like stories. And others are much more song-like. And scale and duration don’t necessarily determine which is which. So yeah the medium is new and there’s a lot that hasn’t been conventionalized. I would add though, that if the norm becomes attractions that take 2-3 hours from the moment you enter the queue to the moment you exit then we should really be thinking hard about the kind of stories being told in those attractions. In the past an attraction being equivalent to a song, scene, or movement has worked well – but I’m not sure anyone wants to listen to the same song for 2 hours unless it’s more like an opera.